Bryan Nesci of Tinton Falls carries beach goers to and from their cars to the beach in Avon. 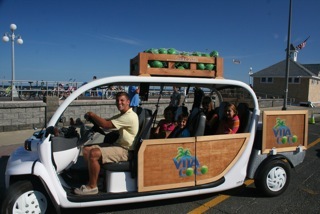 Bryan Nesci’s idea of a summer vacation is operating a free shuttle service for beach goers in Avon-by-the-Sea. The 23-year-old senior at Stevens Institute of Technology in Hoboken is wrapping up his second season of business on Labor Day to return to school where he’s studying mechanical engineering. Nesci has been working seven days a week since Memorial Day picking up and dropping off passengers at their cars and taking them to the Avon beach in his six passenger, all electric golf cart, known as an LSV, or low-speed vehicle. “It’s free, eco-friendly local transportation,” Nesci says. While the ride is free, he has lined up seven advertisers whose messages play on a video screen to pay for the service. Because he’s not operating a taxi service, Nesci says he can’t charge passengers. Nesci got the idea riding the shuttles at Great Adventure and through his own experience of having to park many blocks from the beach in Avon. “The town has been very supportive,” he says, especially the badge checkers who often call him to pick up passengers leaving the beach. “People bring their whole house to the beach,” he says, and the cart has a small area for beach chairs, umbrellas and coolers. Nesci calls his business Coastline Shuttles and says he carries about 1,000 people a week and is considering buying another vehicle next year, hiring a driver and expanding the service. He bought his 7-hp low-speed vehicle at a local dealer for $17,000. It’s registered and insured but because of the top speed of 25 mph, he can only drive where the speed limit is 35 or less. For an ambitious college student, it’s been a great way to meet people and he admits women have given him their number. “I thank them, but say I can’t tell them when I’ll be free,” he said. Posted in Shore Communities and tagged Asbury Park, Avon, Ed Salvas.